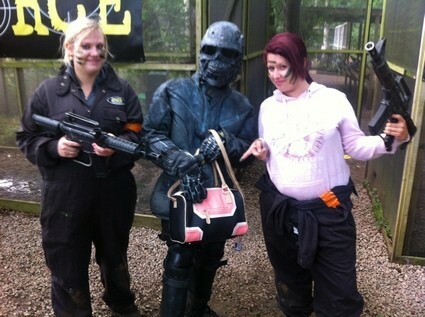 Hen paintball parties: wear fancy dress & shoot your friends! If you’re looking for something a bit different for your hen party, then consider a hen paintballing event at Delta Force Paintball! You’ll get to dart about in the great outdoors wearing fancy dress, hide behind trees and fire paintballs at your friends! Where else can you do that?! Our team of experienced staff have organised and run thousands of successful hen paintball parties over the years and we ensure your day with us is one to remember! 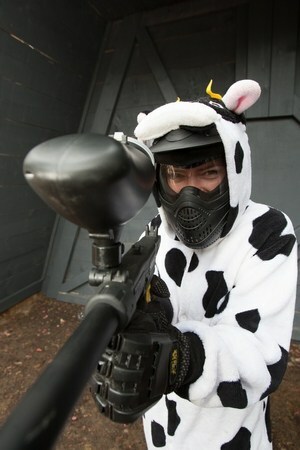 We can even tailor our paintball game scenarios so that the important people in your group (i.e. the hen and appointed bridesmaids!) become the centre of attention. If there’s a president that needs taking out by a sniper, you can decide who plays that character, and who the bodyguards will be! Players are also encouraged to wear fancy dress! At Delta Force Paintball we actively encourage it, and we may even have additional accessories such as target vests and tutus should you need them. At selected Delta Force Paintball centres, we can also offer mini paintball event for hen groups who may feel intimidated by our standard paintball games. These unique and exciting events use smaller, lightweight paintball markers and smaller paintballs; resulting in a softer impact game. Consequently, these events have proven popular amongst our female players who are concerned that playing paintball may hurt.